We have raised honey bees for a number of years, keeping them specifically for pollination and their wonderful honey crop. They are incredible creatures, industrious and gentle - perfect homestead companions. They are so docile that one summer when Master Calvin was just a little lad we found him flat out on his tummy intently looking into a mud puddle in front of our shouse. Upon further inspection we realized that it wasn't the puddle that held his interest rapt, rather it was the honey bee that he was gently stroking with one tiny finger as it sipped a bit of water. The bee didn't sting him, she just flew away when she was properly hydrated (and he had finished petting her). For years I have had intermittent sciatic nerve problems. Generally it is not bad, just a bit achy from time to time, but one spring, while playing on the teeter-walker with the children, I injured my sciatic nerve to the point that I was immobile. I had never been in so much pain in my life! After numerous trips to the emergency room and various doctor visits, I was scheduled for surgery. Although the surgery was very successful, I was more than a little hesitant to begin the prescribed pain pill regime. I have read account after account of people suffering from intense pain only to have a successful surgery and then become addicted to the pain killers. I didn't want to become such a statistic. And so, we went in search of another answer. One evening, as we were discussing various methods of pain relief, Sir Knight recalled a television show he had seen while visiting my parents. He remembered very little about the show, other than the elderly woman they were interviewing had survived hundreds of bee stings after knocking down her back-yard bee hives while mowing her lawn. Almost as an aside at the very end of the show, she mentioned that the hundreds of stings had been terrible, but, on the positive side, she hadn't suffered from arthritis since. Hearing this, Maid Elizabeth went to work. She began to research bee stings and their effects on arthritis. Suddenly, she stumbled upon a whole new (to us) method of pain management - Bee Venom Therapy. It turns out that BVT is practiced frequently in Europe and many practitioners carry portable bee hives from appointment to appointment, stinging patients for any number of ailments. After doing a bit of research, we decided to give it a try. What sold me? Actually it was a combination of anecdotal evidence and scientific research. Most of the people I read about had proclaimed BVT to be nothing but helpful, in some cases curing them, and the science involved seemed to support their conclusions. Bee venom contains Mellitin, and anti-inflammatory that is 100 times stronger than Cortisone! It also contains Adolapin, which is also an anti-inflammatory and pain blocker. Bee venom is also said to increase blood circulation and reduce swelling. About 1/2 an hour before being stung, I took 2 ibuprofen (just to dull the sting a bit - not necessary). I then iced my lower back (over my scar) for about 20 minutes. While I was icing, Maid Elizabeth scooped up a few bees (about 4) from our hive, put them in a jar (with air holes poked in the lid) and put the jar in the freezer. The bees become lethargic when they are cold and it is easier to capture one to use - they don't try to fly away when you take the lid off the jar. When the bees were ready and my back had been properly iced, I laid on my stomach while Maid Elizabeth capture a bee with a pair of tweezers. Holding the bee (stinger side down) next to the scar on my back, Maid Elizabeth gently squeezed the bee. In the process, the bee responded by stinging me. Leaving the stinger in, Maid Elizabeth stung me again on the other side of my scar. If you look at a honey bee stinger closely, you will notice a little venom sack on the top of their stinger. The venom sacks pulse, delivering their venom, for about 10 to 15 minutes. I lay still until both venom sacks quit pulsing, after which Maid Elizabeth removed them with her tweezers. That's it! The area around the sting burned slightly and raised a small welt that got rather itchy. I noticed a lack of pain almost immediately. I DIDN'T TAKE ONE PAIN PILL! I had no pain. None at all. My surgery was over 5 years ago. I have had twinges of pain (and I mean twinges) about 3 times since then. Each time, I've asked Maid Elizabeth to fetch a couple of "the girls" and sting me. Each time, I have gotten up with NO pain. None! I, my friends, am a true believer. Do I think BVT will work for everything? Of course not. Do I think it will work on everyone? Nope. Do I think it worked for me? Without question. I do know that a woman in our church was hunched over with chronic sciatic nerve pain. She had had at least 3 surgeries and finally decided she would just live with the pain. Watching her in agony every Sunday was terrible, so finally I mentioned BVT and what it had done for me. Within the week she way laying on my couch with two bee venom sacks pulsing into her sciatic nerve. Within the hour she was standing upright (which she hadn't done since we'd know her - over a year) and within a week she was asking how to keep bees of her own. My understanding is that BVT is just beginning to emerge in the United States as a viable medical procedure. Apparently there have been tremendous results for MS patients using BVT. It has become more common to use BVT for the treatment of arthritis. And, it is indicated for patients suffering from sciatica (go figure!). If you are interested in homesteading, preparedness, survival or simple homemade medicine then you shouldn't be without your own hive of bees. I know that having "the girls" in my backyard means so much more to me than simple pollination or sweet honey - it means living without pain. NOTE: If you decide to try BVT, make sure you have a sting kit on hand and or an Epi-pen. 1 to 5 percent of the population is allergic to honey bee venom. Thank you so very much for writing a post on BVT, most people don't know about it or understand it. Thank you for sharing this - it was a fascinating read. I've heard of BVT but knew very little about how it was practiced. 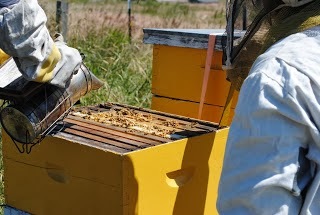 My grandfather had honey bees and I loved to go with him to smoke the bees and check the frames. We didn't have protective gear, but I was never stung while we did this. Grandpa always cautioned us to be gentle with out little friends and that they only stung as a defense. I've been stung twice in my 53 years, once when I stepped on one (we were barefooted hill billy type children) and once on my ear when a bee was caught in my hair as I rode my bicycle. I've captured jars of bees as a kid (until my mom told me, with a flyswatter in her hand, I was keeping them from their work and home and to let them go...NOW) and I've picked up a bee, to several others fright, that just fell from her flight into the dirt while in a barn looking for water most likely to some flowers we sprinkled with water. She rested, drank and flew away. One of God's beautiful creatures! Thank you for this post, I may have to convince DH to have the sciatic nerve area stung and I'll even volunteer to go first. I did bee venom therapy for three years to help with symptoms of MS. I took up to 30 bee stings per evening and did fine. 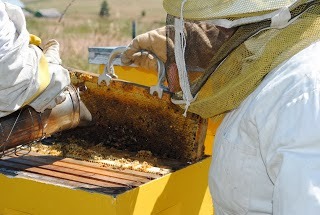 However, we live in Alaska, and over-wintering bees is very difficult to do. Plus there are just some summers that are overcast, wet, and cool, and bees don't do well. Thinking of purchasing some again next April/May and getting back on the regimen. Initial pain, but one gets used to the stings, because they really, really help! Thanks for posting this article. Im just sitting here at my parents house here in Serbia. And im just started to use bvt for my back and leg nerve problems. My father perform me this therapy. Im convince in that method for a long time ago because my mother had a huge problem with sciatic that she was on pain killer for a 6 months and with out any improvement. After one therapy that my father perform to her she just relief all pain from leg and she never had used pills anymore. Im now in the same or similar position like her about 15 years ago. Im believer in natural healing and understand that human should be more close with the nature...to not forget from where we are really come. I'm so glad for you! We have been so thankful for BVT. God is so good in His gifts to His children! I hope you continue to feel wonderful.